The chance to buy an NFL franchise doesn't come along very often. But if you're not one of the select rich folk who received documents from the Bills yesterday, you're probably going to have to wait for the next one. Soon after founder and owner Ralph Wilson died in March, the trustees of his estate—led by his widow—announced their intentions to sell. According to the Toronto Sun, potential buyers received a teaser sale document and a non-disclosure agreement yesterday, formally kicking off the bidding process. So who are the bidders that received the above documents on Wednesday? Likely Tom Golisano, Donald Trump, Terry Pegula and the Toronto group that includes rocker Jon Bon Jovi and Larry Tanenbaum, chairman of Maple Leaf Sports & Entertainment. Probably other prospective bidders — unidentified as yet publicly — received the documents as well. Pegula seems to be the early front-runner. 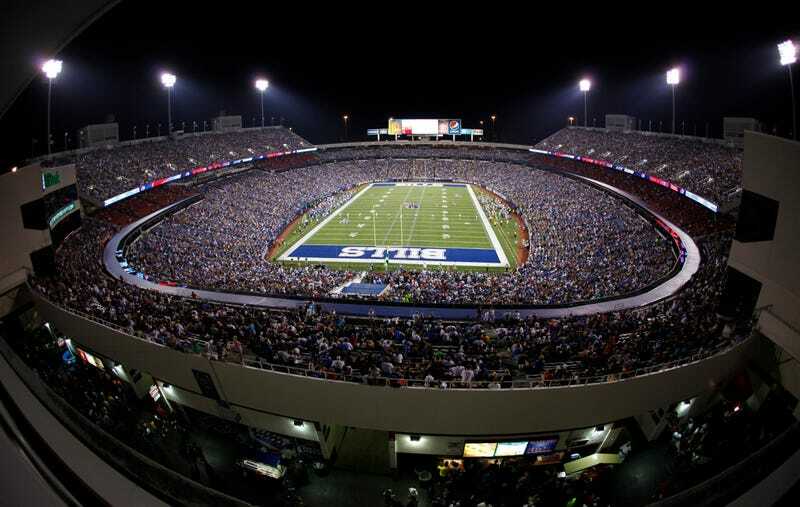 The Sabres owner, worth more than $3 billion, has been liquidizing considerable assets in recent months, and reportedly has "high interest" in buying the Bills. And, of course, he's the most likely to keep the Bills in town. Thanks to a 1997 rule (opposed by Ralph Wilson), owners of franchises in other sports are allowed to own NFL teams, but only if they're in the same market. As for how much the Bills could fetch on the open market, a lot of that depends on what bidders see in the next round of documents. After signing non-disclosure agreements, they'll receive the team's financials, including revenues, operating costs, and future projections. For some context, the last three NFL teams to be sold were the Browns, the Jaguars, and the Dolphins. Those franchises fetched, respectively, $1.05 billion, $770 million, and $1.1 billion.